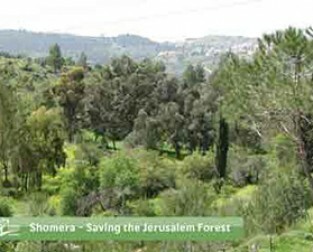 Shomera started out as a grassroots effort to save the Jerusalem Forest. – the capital’s “green lung” filtering pollution swept in from the coastal plain. In 1996, Tamar Gindis, a resident of Har Nof, learned of two large scale proposals that posed serious environmental threats to the Jerusalem Forest bordering her neighborhood: a large scale development project, and the construction of a highway. To save the forest – a 1,200 dunam green lung – Tamar rallied the support of the area’s residents. To ensure permanent preservation of the forest and open spaces in the capital, Jerusalem residents needed to be educated about the resources at their doorstep, and about sustainable urban living. With that aim, she founded “The Committee for the Quality of Life – Har Nof” in 1997 and spearheaded the formation of a coalition of organizations committed to preserving the Jerusalem Forest. 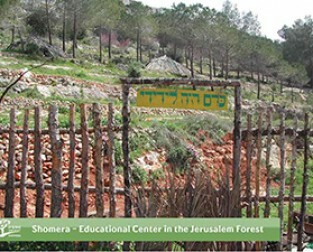 Two years later, the Committee established an educational center at the “Shomera Site” in the Jerusalem Forest, on a 20 dunam site which was permitted for use by the KKL. 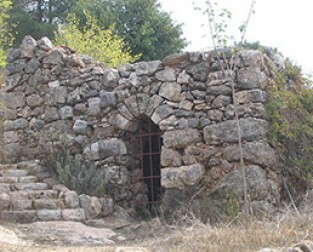 The site was blessed with archeological elements including a “Shomera” – an ancient watchtower, used for guarding agricultural land. The organization began to be associated with the site as a result of the popular activities that it ran there, and as a result changed its name from “The Committee for Quality of Life”, Har Nof to “Shomera for a Better Environment” (termed “Shomera”). A trailblazer in its field, The Shomera Site” was the first ecological center in Israel to teach permaculture and organic gardening to the general public. Throughout the years, Shomera’s educational programs were conducted through experiential, hands-on activities. To serve populations who could not visit the center, Shomera offered educational programming at schools and community centers, including programs for youth at-risk, blind youth, and individuals with special needs.